LuxStone was designed to make life easier—with features like convenient installation, simple maintenance and enduring quality. As you begin the process of remodeling your shower or bath, you may feel unsure of where to start or overwhelmed by choices. With your Shower Guru, you can easily design your perfect shower, all from one source. We'll create your perfect shower or bath. The quality you expect from a brand you trust. A new shower or bath will be fast and easy. Love your shower or bath again. Select each component of your shower or bath from the LuxStone collection for a cohesive design that offers flawless form and beautiful function. Each part of your new shower system bears the name you know and trust in the bathroom for over 140 years. Your Shower Guru will guide you from design to installation, so you know what to expect at every turn, and maybe even have some fun. Each piece in the LuxStone shower is designed to be installed seamlessly together by your Kohler partner team in as little as a day or two. Start each day with a shower or bath you love. A fully custom showering space allows you to store your toiletries neatly, and wash and relax in a space that was designed for your unique bathing routine. We have the knowledge, expertise and products to give you the shower you always imagined. Customize your space with your favorite LuxStone shower walls, faucets and showerheads, accessories and shower doors for a better showering experience. With numerous bottles and bars of soap to store and rarely a place to put them, the shower quickly becomes cluttered. 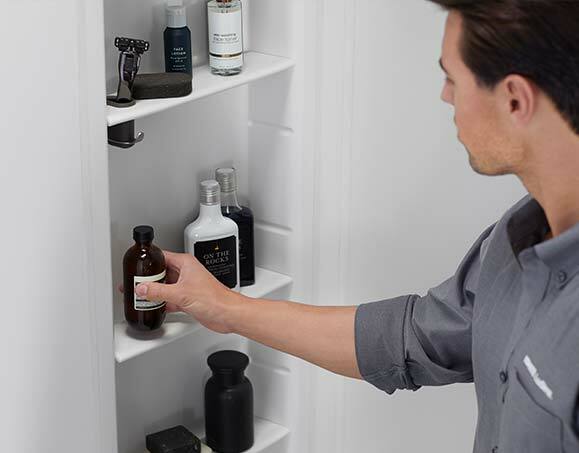 With plenty of storage options to customize your shower, you can effortlessly organize your shower essentials. For many, shower design is more about function than looks. The LuxStone shower was engineered to add beautiful design to a multifunctional space. Choose from several colors, patterns and textures of shower walls that reflect your taste and style. 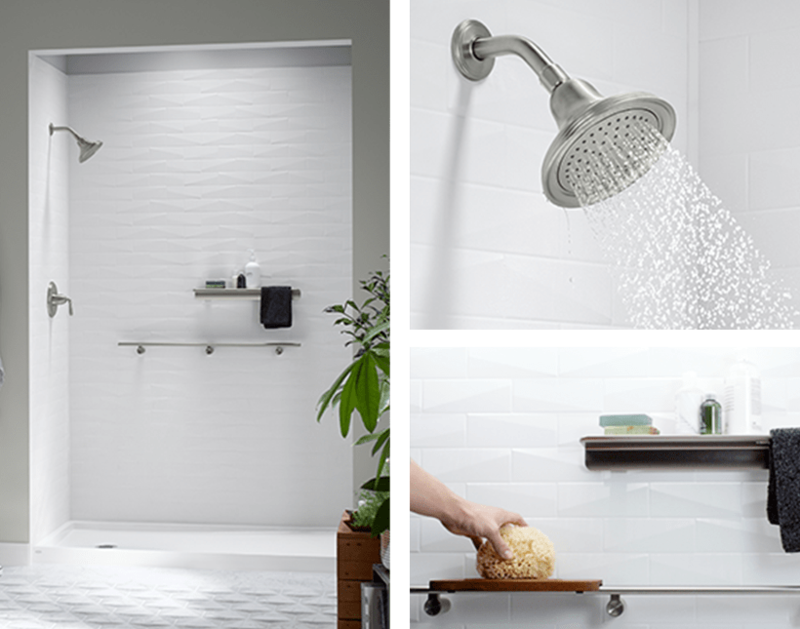 Sleek accessories round out the look of your new shower, and make the space look and function even better. LuxStone shower walls were designed to keep unsightly soap scum and mildew at bay. The surfaces are easier and quicker to clean than tile because they do not show grout or moulding. Naturally nonporous, the shower walls do not attract mold and mildew. Simply use an all-purpose cleaner to keep surfaces sparkling.